MOLINE, IL -- In 1899, a bill to establish Western Illinois University (then called Western Illinois State Normal School) was passed by the state legislature. Macomb was selected in 1900 as the location for the new normal school in west central Illinois, and on Tuesday, Sept. 23, 1902, Western Illinois State Normal School opened its doors for the first official day of classes on the new campus. Faculty, staff, students and community members are invited to celebrate Western's founding at the WIU-QC Founders' Day event Tuesday, Sept. 25 in the Rock Island County Board Community Room (Rms. 103/104) in Riverfront Hall on the WIU-QC campus. This year's event will feature a new format, including guest speaker WIU Alumna Rep. Tony McCombie of Savanna (IL). 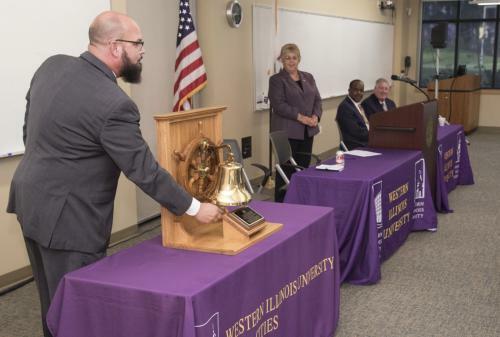 The program will begin at 8 a.m., and the ceremonial ship's bell will be rung in memory of Edwin DeCamp, who first rang the school bell Sept. 23, 1902 to signal the start of classes at Western Illinois State Normal School. Interim Provost and Academic Vice President Kathy Neumann and Senior Vice President for Strategic Initiatives and Planning Joe Rives will serve as host and emcee. "Each year, we gather to pay tribute to the founders of Western Illinois University and civic leaders whose foresight brought this world-class institution to Macomb. One hundred and nineteen years ago, Western Illinois State Normal School was established, and three years later, the University opened its doors to the first class of students in Macomb, Illinois," President Jack Thomas said. "We look forward to hearing from our keynote speaker WIU Alumna and State Representative Tony McCombie, as we commemorate the history of Western Illinois University. I invite our University and community members to join us for the annual Founders' Day Celebration." McCombie has served as the 71st District representative since January 2017. McCombie, who was born and raised in Savanna, owns and operates Blue Appraisals and is self-employed in the real estate industry as a broker with Mel Foster Company. She also served as the mayor of Savanna from 2013-2017 and as a member of the Savanna City Council. McCombie's committee assignments include Business and Occupational Licenses, Business Incentives for Local Communities, Cities and Villages; Elementary and Secondary Education: School Curriculum Policies, Tourism, Hospitality and Craft Industries and Transportation: Regulation, Roads. A light breakfast will be served beginning at 7:30 a.m. Individuals may register for the event by calling (309) 762-3999 (ext. 62209) or by emailing ND-Friedrichsen@wiu.edu. The Macomb campus Founders' Day celebration will be held Monday, Sept. 24 in the Sherman Hall Auditorium. The Founders' Day event, which began in 1994, celebrates the beginnings of the University that evolved from the Western Illinois Normal and Training School with 229 students to today's University, which offers a comprehensive curriculum to nearly 10,000 students.